Posted by tomflesher in Micro, Models, Teaching. Well, finish reading the next paragraph first, and then close your eyes. I am going to offer you unlimited access to something good, something useful, something tasty. 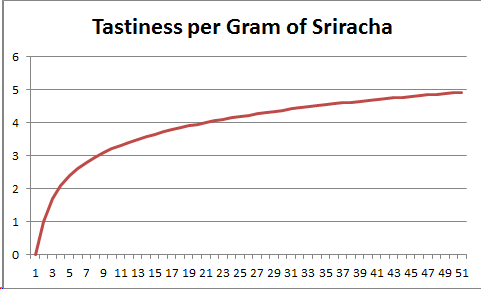 That’s right – I’m going to let you have as big a bottle as you’d like of Sriracha. As long as you can carry it away, you can put as much Sriracha as you’d like on your plate of pad thai and I won’t look askance at you. No, I might even respect you. How much are you going to take? The funny thing about that thought experiment is that everyone can picture how much they’d put on a plate of noodles. Some people might put none at all;1 others might put a little dab on the side, while still others, possibly economics professors who operate multiple blogs with self-deprecating titles, might put a truly ridiculous amount and allow the streets to run red with the blood of the non-rooster-sauces. Almost no one would ever take an unlimited amount of sauce. Just about any good demonstrates diminishing marginal returns, and at some point you’ll have enough of a good that its marginal benefit no longer exceeds its marginal cost. 1 Those people are called wimps.